Alex Honnold: You're standing on tiny edges, small variations in the texture of the rock. If you slip, your hands can't hold you. It's just the two tiny points of contact that keep you from falling, and when you step up, there's only one. 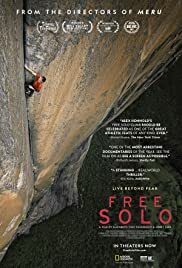 A rousing, crowd-pleasing documentary that showcases the extraordinary capacity of the human body to push itself to the extreme - or in the words of free solo climber Alex Honnold, "to reach perfection" - Jimmy Chin and Elizabeth Chai Vasarhelyi's FREE SOLO makes for one of the most tense viewing experiences I've had in a theater this year. We already know how this documentary will end (any other sort of ending and this would have never been released), but Chin and Vaserhelyi nonetheless manage to convey a palpable sense of fear and tension throughout, as Honnold repeatedly practices climbs in preparation for his free solo climb of Yosemite's famed El Capitan, a 3,000 foot wall of sheer granite. Honnold makes for a fascinating subject as the climber at the heart of the story. Unlike literally 99% of other climbers, however, Honnold specializes in free soloing - climbing without using ropes or any other sort of protection. What Honnold does is insane, and the film repeatedly stresses the fact that one wrong move would result in his death. But Honnold's passion for free soloing is his lifeblood, and despite the inherent (and obvious) dangers of his profession, it's the one thing that keeps him going. 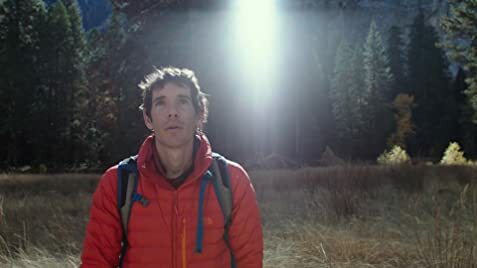 I can't imagine what would ever possess Honnold (and others like him) to do what they do, but what I can say is that FREE SOLO captures his feats in breathtaking glory that left the audience in the theater cheering at the end. Points off for the Tim McGraw song during the end credits, though.